Flat-pack furniture can look fairly small and compact when you look at it in a huge warehouse but once you get it outside to the car you soon realise it’s actually quite large. No matter which child you decide you have to leave behind you still can’t squeeze it in. This is where handyman manchester comes to the rescue. We will collect your flat-pack furnture for you and deliver it direct to your house. Once it’s delivered we will be more than happy to give you a price for assembling it and putting it in place. It may be that you have already managed to get your flat-pack home, opened the box, got all the pieces out on the floor then looked at the instructions and wondered if they are in Russian. No worries, our handyman is here to help and is happy to pick up where you left off. Whatever flat-pack you buy our handyman are happy to assemble for you. Prices vary depending on the furniture and we give discounts on more than one item. Handyman manchester will give you a price to assemble the unit and this is what we charge when we have completed it – no extras. Our handyman will unpack and assemble the flatpack then move it into whichever room in your house it is going to be displayed. We can also assemble furniture for use in offices and your workplace including desks, computer workstations, filing cabinets, cupboards, chairs and sets of drawers. Our handyman is happy to assemble flat pack furniture anywhere in the Manchester area, such as Salford, Hule, Whalley Range, and surrounding areas such as Rochdale, Bury and Stockport. 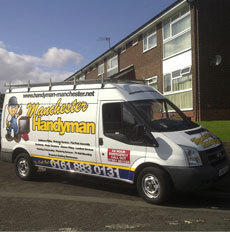 Whichever part of Manchester you are in our Handyman is here to help.